Baby-focused company 4moms today announced its natural-motion rockaRoo baby rocker seat has finally arrived in stores, applying high-tech robotics and motion to keep your little one comfortable. Indeed, those familiar with 4mom's mamaRoo smart baby rocker will notice a major design slim down. The rockaRoo uses motion-control software and sensors to understand your baby’s physical position. This data is used to create unique rocking motions in your choice of five speeds (with thousands of calcuations per second, 4moms boasts) for a more natural feel than fixed-position rockers. There’s even an headphone jack input, so you can connect an iPhone or iPod and play some calming sounds. 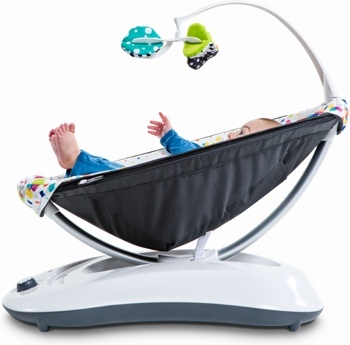 The futuristic-looking 4moms rockaRoo is currently available at Babies R Us, buybuybaby and Target. The base model is $159.99 in machine-washable classic gray; plush versions are available for $179.99.